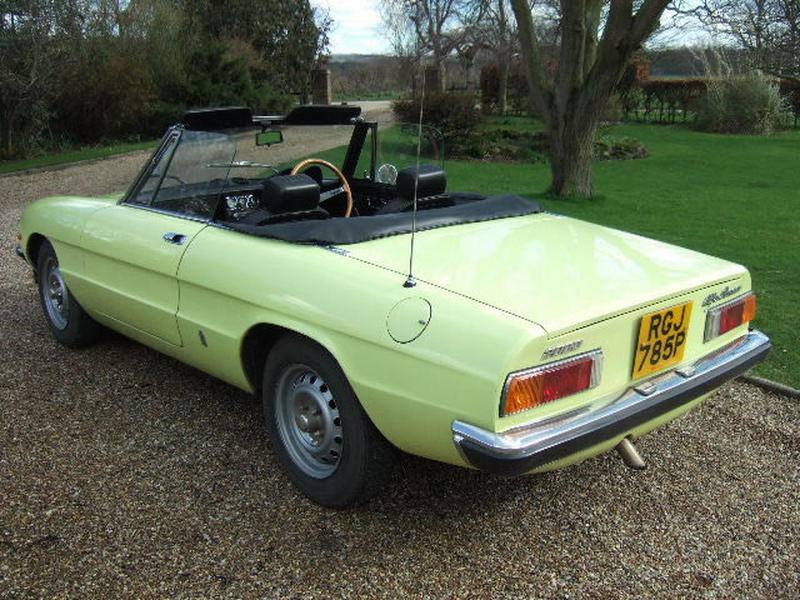 The Alfa Romeo 105 series Giulia Spider as seen in the film The Graduate staring a young Dustin Hoffman and featuring the sound track by Simon and Garfunkel must be one of the most evocative cars that Alfa Romeo have ever made. When it was released, in March 1966, it received very mixed reviews from the motoring press with Road & Track stating "We found almost no disagreement among members of staff about the appearance of the new model - no one liked it as much as the old Giulietta or the Giulia". The Car was styled by Battista Pininfarina and takes styling cues from the Super flow Disco Volante and was named the Duetto. The name has a very unusual origin in that Alfa Romeo decided to have a competition to name the car and this was won by Guidiobaldi Trionfi and the prize was the car. The early Duetto's are now the rarest of the breed and as such fetch the highest prices. The car came originally with a 1600 engine these were very powerful in their day with the 1600cc engine producing 109 bhp In 1968 Alfa Romeo released a 1300cc version of the Duetto called the Spider Junior. Alfa Romeo marketed the Duetto from 1966 until 1969 and unfortunately demand for the product did not grow as expected, the car being still being overshadowed by the beautiful Giulietta Spider. In 1969 the engine was enlarged to 1779 cc and renamed the 1750 in honour of one of the greatest cars in Alfa Romeo’s History. However plans were already afoot to change the styling of the car and 4 years after production started Alfa Romeo chopped the tail off the car and we got the series 2 spider, this is sometimes referred to as the camm tail spider. This also had the larger 2000cc engine with a power output of 132 bhp. Some Alfa enthusiasts still regard this as a backward step preferring the nature of the 1750 engine however the jury is still out on that one, and having driven some of the nicest examples of both I would not like to have to make a choice between them. Evolution of the chassis largely stopped at this point in the models history. The series 3 cars were characterised by the addition of a large rubber spoiler on the boot and a jutting chin spoiler, these cars are the most unloved of the models nowadays, however a nice car is still a good car to drive on a nice summers day with the hood down, and represents quite a bargain compared to the rest of the range. 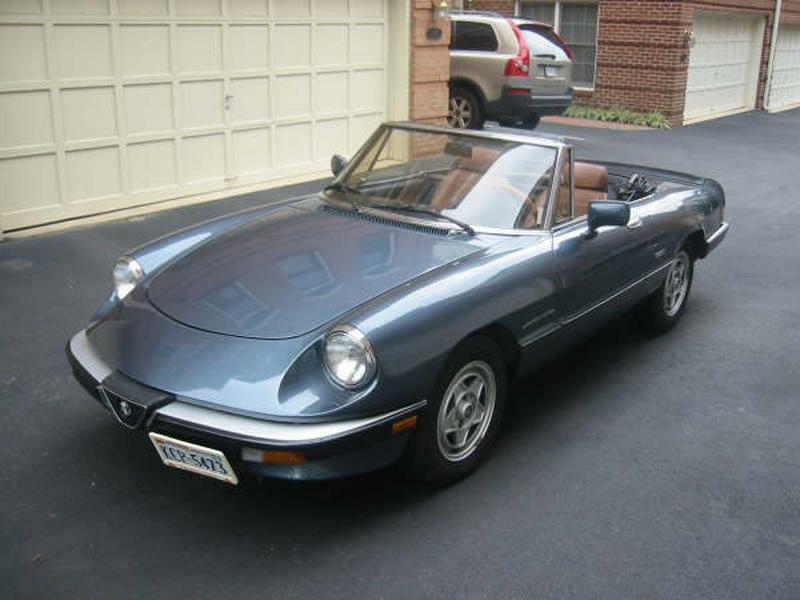 Then in the late 1980s Alfa Romeo brought out the series 4 Spider, this is considered by most people to be a very nice evolution of the model, it got a very subtle lip spoiler incorporated into the boot and the chin spoiler disappeared. The bumpers became a rounded plastic that fits well with the rest of the design. Unfortunately the series 4 was never made in right hand drive so all the right hand drive cars are conversions and only the very best conversions are as good as the left hand drive factory models. The series 4 Spider had all the possible creature comforts that you could imagine with electric windows, electric mirrors, fuel injection as standard these luxury’s started to come in slowly with the series three cars but it was not until the series 4 that the model got power steering which does help the car to feel “modern”. The 105 series Giulia Spider is one of the classic Alfa Romeos and deservedly so being produced for over 25 years. This car should be on everyone’s want list, in the middle of summer nothing is as evocative as driving through a beautiful village with the bonnet sloping away from you and the wind in your hair. If you haven’t tried it, you have missed an awful lot. Rumours abound that there might be another strictly two seater in the mould of the Duetto being considered by Alfa Romeo in 2010.